Anyone familiar with this fellow's take on the Bible, timeline of the earth, universe and man? I think Schroeder has some ties to Hugh Ross? I came across a post of Rick's mentioning him - he didn't seem to know anything much about him. But he appears to validate young earth views from the time of Adam, but not before - per the universe and earth's origins and age. I'm looking into what he has to say, in trying to reconcile old earth, young earth beliefs, and modern scientific analysis. Yeah, I head about it a few years ago. Interesting perspective BUT a case trying to make the bible say what we want it to say rather than what it simply says. Look, The bible is NOT a science book and Genesis is NOT a scientific statement on anything. Genesis simply states that God is the creator AND sustainer of all the exists. Does anyone here think that ancient man would have understood the age of the universe? the vastness of the universe? 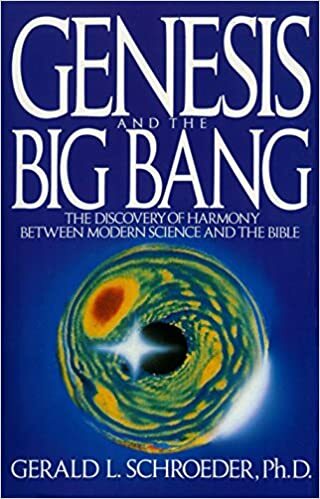 It was written in the only way possible for ancient man to understand that God created all the exists and that the creative process was over time and not instantaneous ( something that no other world view or religion taught at the time by the way). That is your view, there are plenty who believe in a 6 day creation. I can see how you can make the word "day" mean something other then a day. But how do you explain away "evening" and "morning" as being anything other than what the Bible describes it as; as you would understand it if you knew nothing of Judaism or Christianity. Paul: Genesis simply states that God is the creator AND sustainer of all the exists. Does anyone here think that ancient man would have understood the age of the universe? the vastness of the universe? It was written in the only way possible for ancient man to understand that God created all the exists and that the creative process was over time and not instantaneous ( something that no other world view or religion taught at the time by the way). There is significant error in believing that the Bible's creation-related texts were only meant to have understandable information for its original audience - but the writers themselves couldn't have know that. But God knew it! He knew precisely, inclusively, the totality of the readers who would scrutinize those texts, in the modern, scientific era as well. This means there is information there meant for the entire audience that will ever read Scripture. Now, that doesn't mean everything is written to explain a scientific understanding - but some of it surely can be also accurately understood by the immediate context of the era one lives in. Who would assert that the Bible portions written to ancients only has information that they could have understood or gleaned insights from? The writers or the New Testament clearly weren't entirely aware that their letters and words were also Scripture for an audience transcending their time by 2,000 years - but they were and it does. So, I would say there are portions of Scripture with double layers of meanings - accurate for what it was intended to communicate to an audience of increasingly far more understandings of the creation itself. Psalm 19 tells us that God didn't only give us Scripture to understand His handiwork - He gave us much more! 1 "The heavens declare the glory of God, and the sky above proclaims his handiwork. 2 Day to day pours out speech, and night to night reveals knowledge. 3 There is no speech, nor are there words, whose voice is not heard. 4 Their voice goes out through all the earth,and their words to the end of the world. Notice that what the heavens reveal - "KNOWLEDGE!" How much more we today now know about the universe that didn't come from the Bible - it came from studying the knowledge that God tells us through the Psalmist that is to be found within its nightly broadcast. Studying God's handiwork IS to study the evidences of the Creation. The knowledge God offers us, both in Scripture and in the Creation are all parts of His truth, with each having unique things to say to it's generation. So when someone asserts that if the original audience wouldn't have understood a passage to say this or that - it's irrelevant to whether the truth it communicates to the modern audience has such an understanding. HOWEVER, there still must be a meaning to the ancient audience, and when God had Scripture written down, the first audience to receive it wouldn't necessarily fully understand it, but would have been able to understand whatever elements it was intended to teach THEM. And I'd point to all of the prophecy about Jesus before His birth into the world - it wasn't fully understood by the generations recording them - but it made a lot more sense to those studying them hundreds of years later - after Jesus Resurrection. Similarly, this is why we read Revelation while scratching our heads and arguing over its meanings - it's because only to a future audience will events and circumstances of that time make it more fully understandable. But does that mean that it had no knowledge value to the Apostle's generation of the first century, or to us 2,000 years later - course it does - it's just we can't yet know certain things. And that's how Scripture works - its truths are sometimes only gradually understood per the readers' immediate context. I remember reading about this years ago, when I was studying different creation beliefs. I don't remember a whole lot about it, other than I gave it about as much credence as I gave the Gap Theory. How long was the 7th day? Stu, nobody is "making" the word day mean something other than one of its literal definitions. -Time period of unspecified length. -A long, but finite span of time - age - epoch - season. Stu, disagreeing is one thing. But at least be intellectually honest enough not to intentionally misrepresent what others believe, and stop questioning the motives of someone just because he disagrees with you. The same as the other days I would guess. Genesis mentions the seventh day as it does the others. Why how long do you say it was? But if Genesis says that a day is 24 hours (given what I said about "evening and the morning") then there is no reason to think that a day would mean anything other than what it meant for the other days. You didn't address the problem of "evening and the morning" being mentioned at the completion of every day. How can it be anything other than what it describes? Stu: But if Genesis says that a day is 24 hours (given what I said about "evening and the morning") then there is no reason to think that a day would mean anything other than what it meant for the other days. Notice that Genesis 1:14 confirms the purpose of the sun and the moon: “And let them be for signs and for seasons, and for days and years” - indicating normal sun/earth rotations. But with a literalist / young earth view, the sun did not yet exist before Day 4 - so there would have been no ordinary day per those stated markers, right? And note, the text says there were both evenings AND mornings on the three days before the sun was supposedly created (according to a literal reading of the text) – how is this possible? What ancient Hebrew would recognize such as a day, one without sun or evening without it? Also, notice the 7th day is ongoing – Hebrews 4:4-11 indicates that Day 7 was still occurring at the time the book of Hebrews was written – which explains why Moses didn't use the "there was evening and there was morning" phrase for day 7. Why? Because day 7 hadn't ended when Moses wrote the book of Genesis. As well, with the literalist view, we have plants and trees being created before there is a sun for photosynthesis. Clearly, these many things indicate that the Creation days were not normal, 24-hour days based upon a sun-earth day cycle that neither the ancients or we would recognize. Those Days were not normal days, but days of CREATION - they were GOD days! And what is a day to God? 2 Peter 3:8: "But do not overlook this one fact, beloved, that with the Lord one day is as a thousand years, and a thousand years as one day." What does that verse say - it's telling us that whatever length of time is irrelevant to God, and that by His standards, a day's length is meaningless. How can one day's length be as a thousand years? God is an eternal Being, He is "The Ancient of Days!" And NO place in Scripture details the length of time in God's Creation Days. Three days without a sun? Plants before the sun? So the 7th day was 24 hours? And then it was over? So basically we just don't know. I think the speaker, Frank, makes some valid points. We can't deny that Genesis 1 SEEMS to imply a 24 hour period of days ( with no mention how long BETWEEN days). We can't deny that in Genesis "yom" can and does mean longer periods of time other than 24 hours.